Paul Shaffer—born and bred music junkie and longtime leader of David Letterman’s Late Show band—opens up in this candid, endearing, hilarious, and star-studded memoir. From playing seedy strip joints in Toronto, to being the first musical director of Saturday Night Live and helping to form the Blues Brothers, to being onstage every night with David Letterman and playing with the greatest musicians of our time, Shaffer has lived the ultimate showbiz life. Now—dishing on everyone from John Belushi and Jerry Lewis to Mel Gibson and Britney Spears—Paul gives us the full behind-the-scenes story of his life, from banging out pop tunes on the piano at the age of twelve to leading the band every night at the Sullivan Theater. Q: Who and what inspired you early on toward music? Paul Shaffer: I had the kind of Jewish parents who insisted that their kid be musical. My mother played Chopin, Rachmaninoff, and of course the Mary Martin and Ethel Merman at Carnegie Hall live album. On Sundays, my dad would put on the best jazz vocalists: his favorite Sarah Vaughn, Billy Eckstein and Ray Charles, who, he taught me, was a genius. For folks who lived up on the north shore of Lake Superior, their taste in music was pretty damn hip. They started me on piano lessons at six; my mother said, “When he can read English, it’s time for him to read music.” After one lesson, I started to pick out tunes on the piano by ear, fascinated to discover that the notes of the scale could be used to play songs that I liked, not just those I had to play for my lesson. Then I heard rock ‘n’ roll on the radio, and it was all over, I became obsessed. When I figured out the three basic rock chords, I could play all the songs. I would come home from school and bang them out on the piano as loud as I could, so the sound just got all up in my ears. When I got a little older, I didn’t buy 45s, I just learned them off the radio. I would recreate the whole sound, all the parts, with my hands. 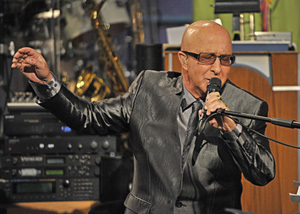 World-renowned bandleader Paul Shaffer has been David Letterman’s musical director and sidekick on CBS-TV’s “Late Show” for the past 27 years. A Grammy Award-winning master of musical and verbal improv, he has conducted a televised jam that included Bob Dylan, Mick Jagger, Tina Turner, George Harrison, Ringo Starr, and Jeff Beck; been musical director at the White House; delivered the riffs that got the nod when he played with Ray Charles, and traded on-air quips with celebrities from Julia Roberts, Tina Fey, and Nathan Lane to Bill Murray, Donald Trump, and Jack Black. Shaffer’s professional career was launched in 1972 when, after hearing him play piano, composer Stephen Schwartz hired him on the spot to be musical director for the celebrated Toronto production of “Godspell.” The now-legendary cast included Eugene Levy, Martin Short, Andrea Martin, Victor Garber, and Gilda Radner. The show was a massive hit and Shaffer’s star ignited. Two years later, he opened on Broadway, playing piano in the musical, “The Magic Show.” The next stop on his trajectory was a five-year stint with a new television show, “NBC’s Saturday Night Live.” He played keyboards, composed special musical material and, in 1980, became a featured performer; his dead-on impression of Don Kirshner became an SNL mainstay. In 1977, Shaffer took a brief break from “Saturday Night Live” to star in the CBS-TV comedy series “A Year at the Top,” produced by Norman Lear and the aforementioned Don Kirshner. After his return to SNL, he collaborated with Gilda Radner on the songs for her one-woman Broadway show, “Gilda Radner: Live from New York,” in which he also appeared. He served as musical director for the Blues Brothers—John Belushi and Dan Aykroyd—on their double platinum album and national tour. In addition to his albums “Coast to Coast” (1989) and “The World's Most Dangerous Party” (1993), Shaffer has recorded with such diverse artists as Diana Ross, Yoko Ono and Robert Plant’s Honeydrippers. He composed the “Late Show” theme song and, with Paul Jabara, wrote the #1’80s dance hit “It’s Raining Men,” performed by the Weather Girls and re-recorded by Geri Halliwell for the “Bridget Jones’s Diary” soundtrack, topping the British pop charts in 2001. In 2002, he received his first Grammy Award, Best Country Instrumental, for the “Earl Scruggs and Friends” album. He also co-produced an avant-garde jazz album for his mentor, Tsziji Munoz. Shaffer has served as musical producer for the Rock and Roll Hall of Fame induction ceremony since its inception in 1986. He led the band for the “We Are the World” finale of “Live Aid,” hosted CBS’s 1994 New Year’s Eve special from New York’s Times Square, and was musical director of the closing concert at the 1996 Olympic Games. He appeared with the Blues Brothers at the 1996 Super Bowl halftime show and was musical director of the 1999 “Concert of the Century” at the White House, featuring Eric Clapton, B. B. King, Gloria Estefan, ‘N Sync and others, to aid music programs in public schools. He was the musical director of Paul McCartney’s “Concert for New York” and appeared with Faith Hill on the “America: A Tribute to Heroes” telethon, both of which honored and raised money for victims of the September 11, 2001, terrorist attacks. Shaffer holds two honorary doctorate degrees, was inducted into the National Black Sports and Entertainment Hall of Fame, and was awarded a star on Canada’s Walk of Fame. Paul recently received the Order of Canada, the highest Canadian civilian honor. He lives in the New York area with his wife and two children. David Ritz has co-written memoirs with, among others, Ray Charles, Aretha Franklin, and Don Rickles. He also co-wrote "Sexual Healing."